On September 24, 1963, Thomas William Washburn, the first child of Owen and Sheila, was born. There was an intensity about Thom, even as an infant, and any parent who has had a colicky baby will know what I am referring to. It used to be thought that colicky babies were ill, or somehow, improperly developed. Recent research, however, has suggested that colicky babies are simply those who know what they want and need, and set about acquiring it in the most direct manner possible. These researchers must have met Thom. As a young child, Thom was quick and strong, and fearless. Upon visiting the sheer cliffs of Southwest Head, Grand Manan, my mother tightened her grip on his hand, and cautioned him, "Don't go too close, Tommy, you don't want to fall in!" He carefully and deliberately leaned over the edge, peering down at the frothing seawater and jagged rocks some ninety feet below. Then, he smiled reassuringly at my mother, and said, "I won't go down there, Mummy. I don't want to get my new shoes wet!" Thom believed in his own powers and strength. After playing street hockey with several boys much larger and several years older than he, my mother asked him if he had been afraid he might be hurt. Again, he smiled at her lack of understanding of the situation, and said, "No Mummy, I'm Superman". Although, much to my mother's relief, his colic had passed with infancy, Thom retained a personal intensity in his character. By the time he was six, he was sharing the backseat of the family car with three little siblings. Being in a small space with Thom was intoxicating for Nancy, Ken and me. Although my parents would try their best to distract us on long family car vacations, there was an inevitable wildness that would creep into our games. I remember being helpless in the grip of riotous laughter, even while we could see a kind of grim quietness settling on our parents in the front seat. Being around Thom was exhilarating. As with so many of his character traits, Thom turned this ability to energize, and to project that adrenaline and intensity into those around him into a great strength when he discovered the joy of sports. I have a clear recollection of him at about nine, chanting, "Bobby Orr, Number Four!" Thom was big for his age, and possessed an agility and self-knowledge that made most sports easy for him. He emulated Bobby Orr's spectacular rink-length charges to score, but was also a team player, who allowed his energies to flow into others. He was always hardest on himself, and threw himself into being his best. He was once told by a hockey coach that soccer was great summer training for hockey, so he joined soccer, excelling at that sport at a provincial level. Although he could have progressed beyond Peewee Triple A, ultimately Thom withdrew himself from competitive hockey. He had begun to temper his love of competition with self-control and a sense of personal direction. He continued to play hockey throughout his life, but sought to channel his considerable energy into several new directions - the social life of a handsome teenaged boy, and his plans for his own pending adulthood. In his high school years, Thom seemed to be involved in everything - the student council, the music department, the soccer team, and DJ-ing the student radio. In his final year, he was vice-president of the school council in a school of 3000 students. As a lowly ninth-grader, I remember him in those years as much larger than life, bristling with the kind of joyful and hopeful energy that some teenagers are blessed with. He seemed to be surrounded by cool kids all the time, many of them female, and for awhile, I had this strange popularity with girls three years older than I, as many of them tried to enhance their standing with Thom. If they had understood the nature of social dynamics between teenaged siblings, they might have been less hopeful of their efforts! Throughout this time, I also have an image of Thom looking forward, gauging the distance to his next destination, and we all knew he intended to leave Fredericton after graduation. In the fall of 1981 he entered into the Co-op Chemical Engineering program at the University of Waterloo in Ontario. This period was very challenging to Thom. He had left a community that knew and respected him and his natural leadership skills, to be thrown into an exhausting, competitive cohort of over-achievers and linear-thinkers. It was sink-or-swim, and Thom set about remaking himself along the lines of Mark Spitz. To me, Thom came out of his university days more unassuming and alone, but concentrated, somehow condensed, and equipped with new abilities and self-knowledge. And yet, timing was not on Thom's side. 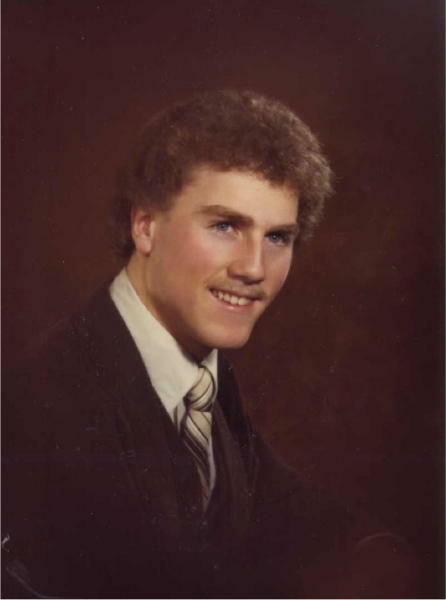 The mid-eighties were not a time to be graduating in the oil industry. In his personal records, one can see his response to this time and his professional prospects. He doggedly persevered, sending out dozens and, possibly, hundreds of CVs. There are pages of notes culled from job-hunting seminars and manuals, as he honed his skills and developed new ones. He carefully filed the responses, acknowledging their existence, but refusing to allow them to turn him from his chosen path. I think that in this reaction to unemployment I have gained a measure of the man he became. Through this workman-like approach, he achieved his goal, finding the job that he wanted with ABB Lummus in Toronto. In this time, he re-ignited a romance with a girl he had met while working on a summer job in Saint Andrews, NB as a teenager. He eventually married Donna Harrison in Toronto, in the summer of 1988. After working in Canada for a while, the two of them were posted for a year to a construction site for a petrochemical plant in Fuchun, in northern China. Their world became defined by each other and work, and it was both enlightening and difficult for them to be in such a strange and distant place. After the Fuchun project ended, Lummus closed its Toronto operation, and Thom left the Company. Again, Thom applied his skills to a thorough and exhaustive job-hunt. This time, he and Donna landed in Clinton, Iowa, where he first worked in a polyethylene plant, then a hardware manufacturing plant. As ever. Thom was scanning the horizon, charting his future course. He started his studies in an MBA program in a local university, completing it in his evenings. As he juggled his immediate responsibilities, he grew distant from old friends and family, and yet he struggled to visit us whenever he could. We often do not recognize turning points in our lives, and it may be that Thom did not realize the changes that would come when he seized an opportunity to return to his old company, ABB Lummus, this time working out of the Houston, Texas office. After a time, he was posted to the Czech Republic, and this time he went alone. During the 18 months away, he began to re-express his natural leadership skills, and rekindle his enjoyment of being in the centre of a big group of friends. He learned to love Czech beer, and shared his love of hockey with his new Czech friends. When he returned to Houston, he found he had grown and changed and he and Donna parted ways. In the few years since his job in the Czech Republic Thom rediscovered his joyful, exuberant optimism. He talked of coming home more often, of playing golf with Dad, of harassing his siblings more, of renewing his old friendships. He became as fit as he had been in high school, began playing hockey and golf again, and took up marathon biking. Just six weeks ago, he participated in the M-150, a 150-mile race to raise money for Multiple Sclerosis research. Eventually, ABB Lummus developed a major project in Saudi Arabia. Thom resisted early offers to move and work there. Finally, just after he turned 40, he was promoted to project manager. His acceptance of this promotion meant that he would have to divide his time between Houston and Yanbu, on the Red Sea. It was there, on May 1, 2004, that terrorists came into the company's office assassinated five of his colleagues and left him paralyzed with bullets to his neck and head. My parents immediately flew to be with him. After a week in a Saudi hospital. Thom was transferred by air ambulance to the Memorial Hermann Hospital in Houston, Texas. During this time he was lucid, even gracious in his circumstances. He greeted friends and visitors, including two powerful Saudi princes who came to the hospital to speak with him. After they left, Thom commented wryly about the large Saudi royal family, saying to my parents, "Only 398 more princes to go!" We were anticipating a long and painful rehabilitation for Thom, but on the day after his arrival in Houston, he lapsed into a coma, from which we could not wake him. The head of neurosurgery told us that most people with these kinds of injuries would have died within 72 hours. He had drawn on his intensity, strength and bravery, and had fought to survive. Eventually his injuries won, and he ceased to fight. He died on May 14, 2004. It will be a very long time before we can think about Thom, the promise of his life, and all of the things left undone, without great pain. It may be a lifetime before I can contemplate the reckless hate and the horror of his passing. Nonetheless, we have found great comfort in our friends and families, and in the past few weeks we have gotten to know many of his new friends. Through their fond memories and funny stories of Thom as he lived, we have gained a renewed appreciation for his warmth and his power to inspire. It takes my breath away to imagine the hole in our lives that his passing has created.